As you know, recently I've been working lots on my business plan. I've discovered so many things that I'm kicking myself over for not having done sooner. For example, I made a media kit for my Writers and Authors blog this past week. This is something I should have done at the start. I think it came out pretty good. You? If you have any suggestions about other things I should have included please let me know. I love getting your feedback. When I think about it, I can't believe I didn't make this sooner. So much potential money just thrown away. Seriously. I've had more enquires about advertising on the site in the past week than the rest of the year put together! So why didn't I do it sooner? Because I started the blog as a hobby. It developed into a business over the years. I wasn't a "Blogger". I was just blogging. When I started out all those years ago I wasn't looking at the big picture. I was just experimenting and having a bit of fun on the internet. Whilst I'm still experimenting and having fun my goals have changed. What was once just a hobby is now a business. Now I have to fill in the holes I left out. The same thing applies to my writing and illustrating. It all started as just a hobby. Back in the beginning I didn't know I could make a career out of doing what I love. It would all be so much easier if I'd started out as a business right from the word go. I wouldn't find myself struggling to fill in the gaps now If I had. I would also probably have reached a higher level of success sooner, and probably made a lot more money along the way too. If I could go back in time and do it all over again I would approach it with a different mindset. I'd be a business right from the start. I would consider things like business plans, branding, marketing strategies, keywords, SEO, etc... more seriously. I would create business materials at the start. This applies to all areas. Not just my blogging business. I think a lot of writers and illustrators fail to see themselves as a business, but we are. We are our brand. That means we need to treat ourselves like any other business would. What regrets do you have about your career? 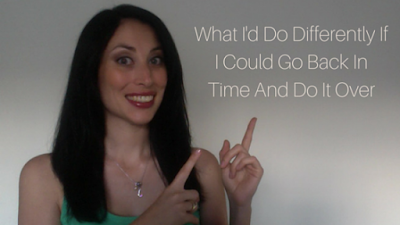 What would you do differently if you could go back in time and do it over? I regret not starting blogging sooner and I definitely need to start a media Kit asap. You just gave me some ideas Jo and I Thank You! What guarantees do you give as to any results for Advertising on your website? Any testimonial?. I am definitely interested! Hi Julie. I probably should have included some testimonials in the media kit [makes note]. 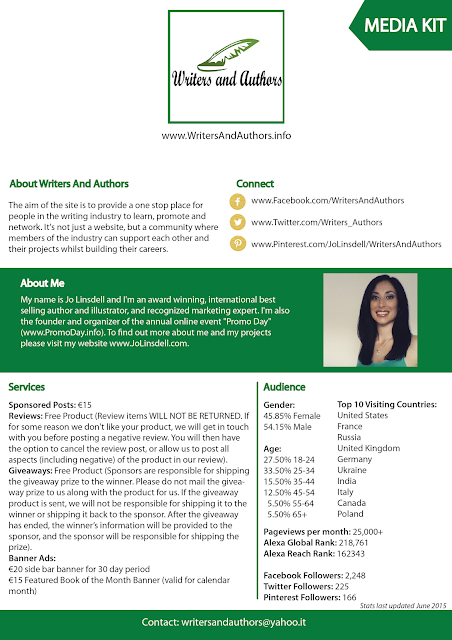 Drop me an email at writersandauthors@yahoo.it and I'll give you more information about advertising on site. What I would regret about my career is not getting my Master's Degree quicker. I just got it 2 yrs ago at 45 years old. The funny thing is I've always felt I couldn't do it. Same thing with the entrepreneurial thing. I've gotten really close what 3 times now to making it a f/t gig and then backed away. I guess I just did not have the confidence or business education/training. I've always been in the social service sector so basically I've been learning over the last few years about branding, marketing, SEO and such. But I do love to write & have been for awhile now. It's really easy for me. Math not so much ha.. So I guess to answer your question, I probably would have hired a business coach a long time ago. I had no idea that they even existed or what they were for until a few yrs back. Hindsight is 20/20 huh? Nice article and I now learned what a media kit is and why my business probably needs one. Thanks for dropping by Cindy. I'm not a fan of math either ;) I think the confidence issue is one that holds a lot of people back. Do you know a good business coach you can recommend? OOh I love that you just shared this with us Jo! I could really do with making a media kit too - doh! I also love how you are doing what you love - you are absolute proof that you can and should follow your passions. More power to you! You know how some people say they have no regrets and they wouldn't change a thing because it took them to where they are now? Well I would have stepped into my entrepreneurial power waaaay earlier - it was a long drawn out process, worth it - definitely! But could have been shorter - lol! Having a media kit really does make a difference. If nothing else it shows that your serious about your blog and have a professional approach. If you want to do sponsored posts, ads, etc... it's a must. It's also handy having all the info in the one file for when you do guest posts on other peoples sites too. Hosts sometimes like to create an intro about their guest. With a media kit they have all the important info right there to pick from. I think when you start out doing it for the joy of it, that shines through. That's where a devoted following is built. When I started my blog, it was a hobby only. It still is except now I'm being contacted by companies to review things. Your media kit looks wonderful. Thanks Lacquer. Very true. I think you need to be passionate about your topic. Readers can tell. Great that you're being contacted by companies. What do you blog about?